Home Mammals Carnivorous Mammals Where Do Raccoons Sleep? Where Do Raccoons Go During the Day? Raccoons normally prefer living in wooded areas so that as soon as they feel any danger, they may climb up the trees. Therefore, open terrain is not one of their favorite places to thrive. During winter, they seek warm shelters and spend most of their time in their dens, going into a deep sleep (called Torpor), which is not true hibernation. Because raccoons are rarely visible in daylight, this makes most of us to wonder where do raccoons go during the day or perhaps more importantly, where do raccoons sleep or nest? Since raccoons are nocturnal mammals, they are mostly active after dawn and dusk. Even though they spend most of their daytime in sleeping, some female raccoons may occasionally come out during the day in search of more food. Where Do Raccoons Live During the Day? Where Do Raccoons Sleep and Nest? As far as raccoon habitat his concerned, this mammal usually occupies both mixed and deciduous forests. However, raccoons are highly adaptable mammals and they can adjust to almost any kind of environment. This explains why these animals are now present over an extensive range like in coastal marshes, mountains and urban settlements. You will often find a sleeping raccoon within cracks of old trees. This is because hollows within old oaks and under the rocks are some of the preferred places where raccoons go during the day and sleep. They also use these old trees and rock crevices for winter denning. If a raccoon cannot find a place to den, it may use dense vegetation and burrows of other animals. Thus forests, woody plants and shrubbery are the places where raccoons go during the day. Some of the common places where raccoons sleep and nest are rock clefts, small spaces under decks, homes or buildings that are no longer in use, barns, woods and abandoned nests and burrows of other animals (like squirrels). As weather becomes more pleasant and less harsh, these mammals mostly sleep on tree forks. In warmer days, they find it convenient to sleep on open shelters. As winter sets in, raccoons seek out warm and cozy places for sleeping and denning. This is why they usually find their way into the attics, garage, walls because they are perfect winter denning sites for them. As a result, you will often spot a raccoon rummaging through trash cans in your backyard, garage or crawl spaces under the deck. Normally, raccoons like to use dens or burrows of other animals. Due to their adaptable nature, they do not find it hard to settle in burrows or holes dug by other animals. For that reason, you will often see a raccoon using holes for denning as well as nesting purposes. Generally, however, they nest in hollows of old oak trees and take up spring or summer residence on ground. To avoid harsh cold winter, they may occasionally share their dens with other animals, like skunks. Do Raccoons Live in Trees? Raccoons mostly occur in places where vertical structures are abundant. For a raccoon, climbing up trees is a piece of cake since they are one of the best climbers. They can quickly climb up trees to make dens inside abandoned hollows or tree crotches. These animals prefer living in trees that have long branches. 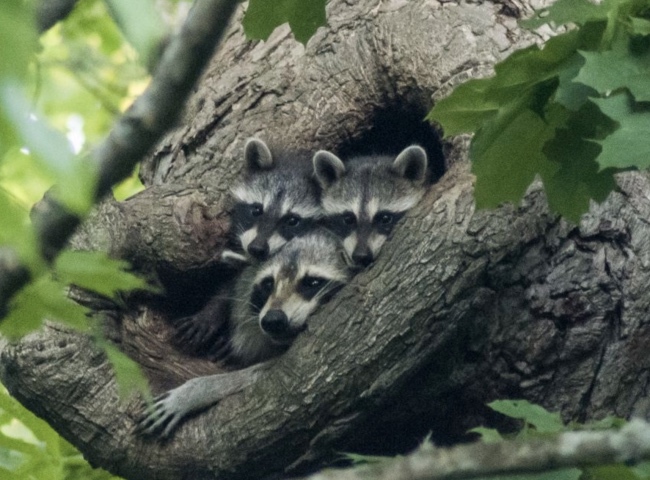 Actually, a mother raccoon will often live in a tree hole high enough to avoid predators and raise her young out of harm’s way. Moreover, one of the benefits for living on treetops is that it would be quite convenient for raccoon to attack the prey from above. Thus, trees provide them shelter as well as place to hide from predators.